Beautiful, personalized Christmas greeting cards can be expensive, and it is often difficult to find exactly the right one. Making unique, personalized Christmas cards is not as hard as you might think, though. As well, making your own Christmas cards is certainly cheaper than buying several boxes of cards and using only a few from each. Even rationalizing by promising to use them up "next year" doesn't always work - especially if you forget where you safely stored them to use "next year." 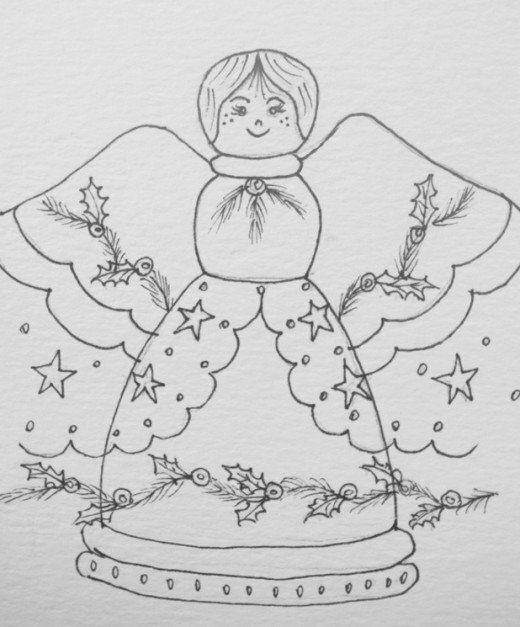 Simple pen and ink sketching, combined with watercolors, will produce beautiful, handmade, watercolor Christmas cards. 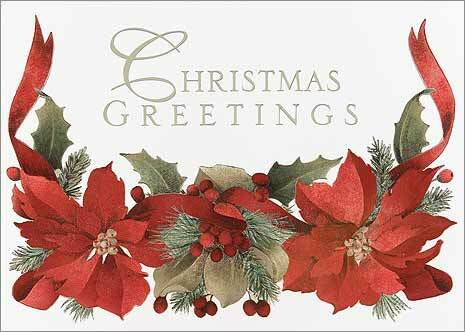 So many patterns are available in every style of Christmas greeting card, from Country style cards to traditional Christian Christmas cards, as well as modern and vintage designs. Even if you have never drawn anything before, you will be able to make lovely cards by using these techniques. As well, choosing your own patterns and adding your own verses and sentiments to the inside of your homemade cards will allow you to personalize your cards to suit everyone on your mailing list. 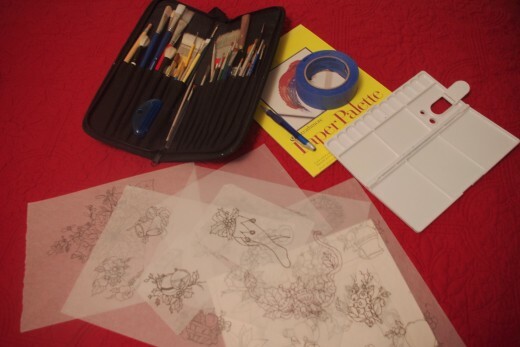 This article, the first in this two part series contains information on the tools and materials you will need, as well as step-by-step instructions on tracing, and inking your Christmas cards. Part 2 has detailed instructions for painting each of the patterns. The first step, as always, is to gather up your tools. To make your personalized Christmas cards, you will need watercolor paper or watercolor cardstock, 2 graphite pencils (H and HB), a pencil eraser, cotton swabs, paper towels, masking fluid - clear or tinted, your choice, a set of watercolor paints, watercolor brushes, tracing paper, graphite paper, a drawing pen with waterproof ink, clear tape, watercolor paper-tape or artist’s tape, and your pattern of choice. You will also need 2 cans or jars for holding clean water - one for washing your brushes, and the other for painting. Some artists prefer to draw their designs freehand on each card. If you do not wish to draw your own designs, or simply want to repeat the same design on several cards, creating a pattern is your best choice. 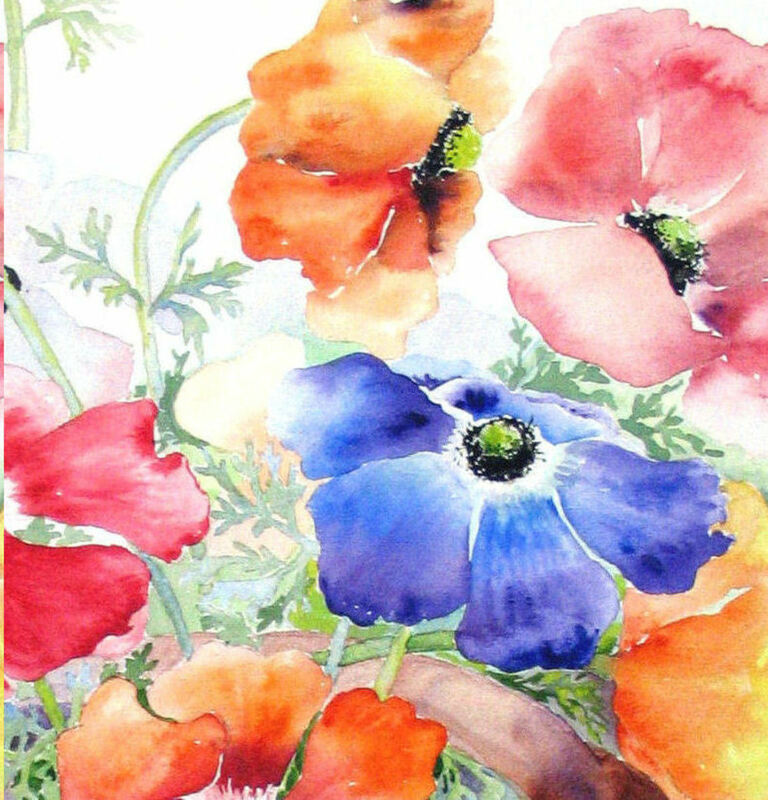 I prefer a good quality watercolor card-stock - using a pre-folded, pre-made card and envelope is always simpler. If no card-stock is available though, you can use watercolor paper that has been trimmed to the right dimensions to fit a standard Christmas card envelope, and carefully fold the paper using a bone folder, or any good scrap-booking card stock folder. Instead of cutting the watercolor paper into the dimensions you need, try creating a decal-edge. Lightly mark the edges of the finished card on your paper with a fine-point pencil. Dip a finger in clear water and trace along the line, moistening the paper evenly. Then, place a steel ruler on the card at the line and press down to hold the card firmly in place. Remove the excess paper using a firm, even tearing motion. Once you have torn or cut the paper to the correct size, measure and lightly mark the center fold-line. Score the line with the edge of the bone folder, using a ruler to keep the score-line straight. Then, fold along the scored line, and press the fold flat with the edge of the bone folder. Place a sheet of tracing paper over top of it. You may need to make a color copy of the original so that it can be resized to fit your card. Most color copiers include this feature, though it may take a bit of experimentation to find exactly the right size. Once you have correctly sized the design you wish to use, tape it to your work surface with a small piece of clear tape at each corner. Tape a piece of tracing paper over top of it, and tape down a top and bottom corner. Carefully trace the outlines of the design onto your tracing paper using the H graphite pencil. Lift the paper often to check that you are following the contours correctly. If the design you have chosen will fit onto one area of your card, no further prep is necessary. I suggest one further step if the design will fill all or most of the card: watercolor paintings usually have a white border around the painted picture. Using moistened watercolor paper-tape, or blue artists’ tape, create a ¼ inch deep border around the outside of the blank Christmas card. Once your finished card is dry, you can remove the tape, and your card will have a pristine professional-looking white border. Tape the card to your work surface with a piece of clear tape in each corner. Place the tracing paper pattern over the card, and position the pattern where it is most pleasing. Holding the tracing paper in place, apply a piece of clear tape to the top corners. Carefully slide a piece of graphite paper under the tracing paper, and tape down one side. Then, raise it briefly to check the pattern is still in position, and tape down the remaining corners of the tracing paper, fastening it securely to your work surface. Using an even pressure on your HB pencil, carefully trace the outlines of your tracing paper pattern. Lift the tape on one corner periodically to ensure the design is transferring to the card. Check your card once you have finished tracing all the outlines to make sure you haven’t missed any lines or details, and then remove the tape completely. 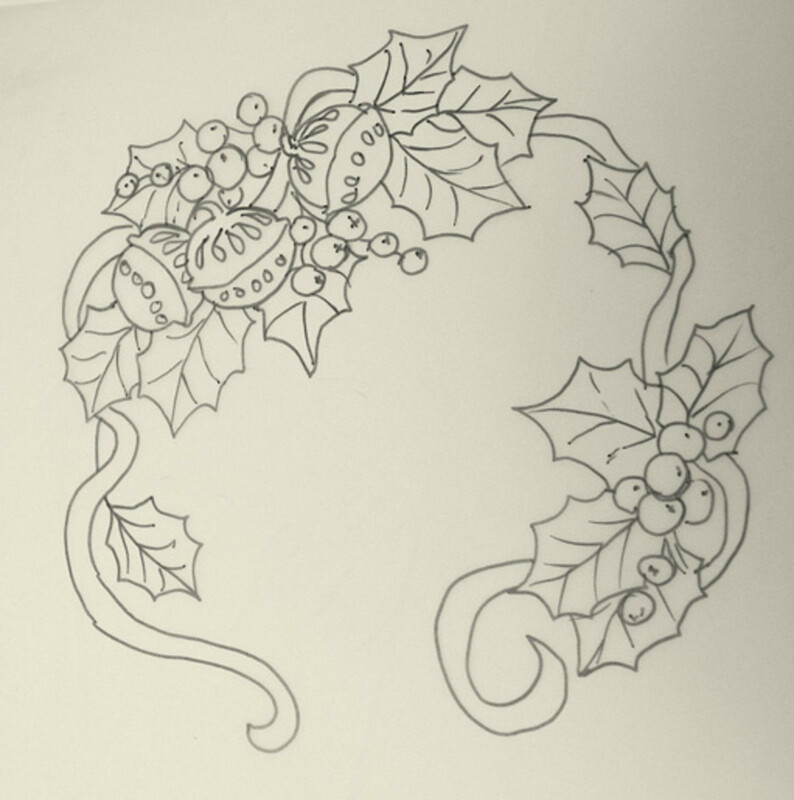 Your Christmas card is now ready for inking and painting. Hold the pen almost straight up and down, turning the nib often. This will give a more even weight to each stroke, and prevent uneven wear on the pen nib. Use a gentle, flicking stroke to release the pressure on the nib towards the end of the stroke. This technique will feather the stroke. Maintaining an even pressure through to the end of each pen stroke will result in a heavy, solid line that has little texture or lightness. Be sure to have a piece of scrap watercolor paper handy to practice each section of the design, before attempting it on the card. Each design is built up in successive layers of strokes to achieve a gradation from light to dark. Never try and achieve a dark area by pressing hard or concentrating on one area. The best result is always obtained by working the drawing as a whole, building up the dark areas with layers of texture, rather than heavier strokes. This will also prevent an area from looking overworked or having too much contrast in comparison with the rest of the design. Most of the designs I use for Christmas cards use some shading, but many of the designs rely on simple outlining and watercolor washes to achieve a lovely finished result. Some prefer the simplicity of a beautiful Pen & Ink design, and choose to skip the painting step for some of their cards. You can finish your inked cards without painting them, in a variety of ways. You can hand-letter your message on the inside, or use one of the many beautiful stamps available in scrapbooking and craft stores. You can print several Christmas greetings on one sheet of card stock, and cut them out with scrapbooking scissors to give each one a fancy scalloped or decaled edge. Apply double-sided tape to the back of each message to fasten them into your completed cards. You can also fasten the printed messages into the cards with decorative brads, and dainty ribbons, for a festive touch. 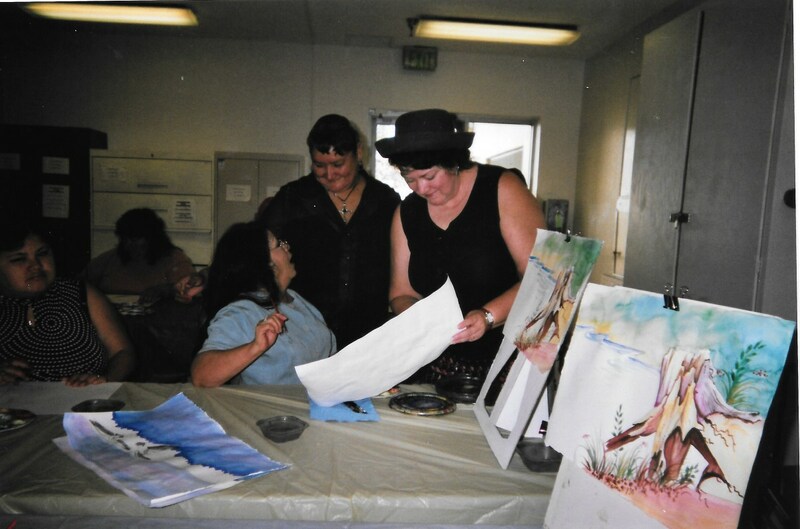 DON'T BE AFRAID TO PAINT WITH WATERCOLORS Try this exercize. Thanks so much. Kids love making these cards, almost as much as their parents, grandparents, aunties and uncles enjoy receiving them. Thanks so much for stopping by. This is a gift with a personalized touch. A wonderful craft for both kids and adults. Thanks so very much, carol7777 - glad you enjoyed the hub, and thanks for the vote up! You have great instructions here to design and make holiday cards. I like your easy steps to follow. Great job. Voted UP. I think hand-made cards are certainly more personal, SanneL. It's a fun activity for families, and kids love making cards. 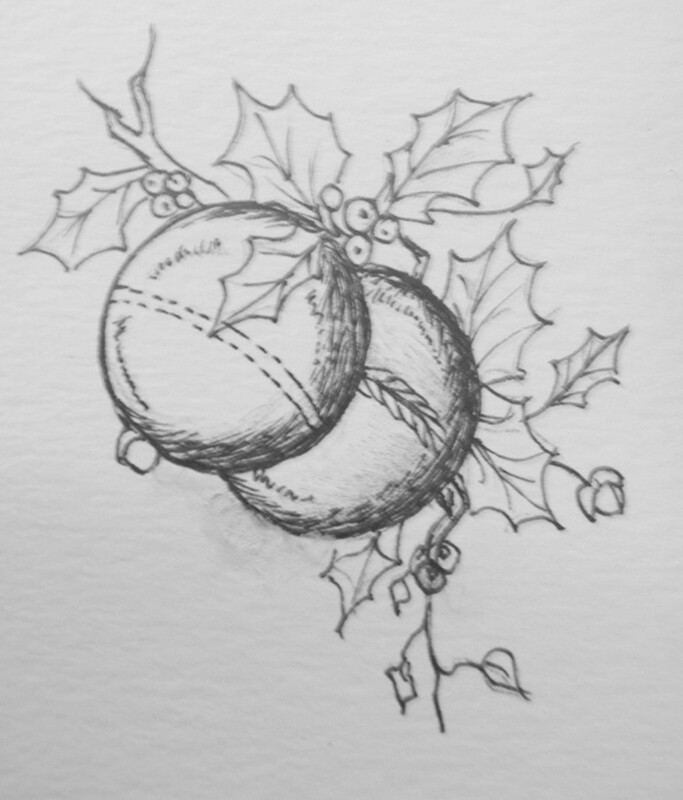 There is nothing better than to find a hand-made Christmas card in the mailbox. This is a great hub for the upcoming Christmas, and there is still plenty of time to start making hand-made Christmas cards. Thank you for sharing these great inspirational ideas with us! Good for you, lpanfil! Glad you enjoyed the hub. Nice hub. I'm going on over to 2 right now. CollB, lovely to find a kindred spirit in card-making! A superb way to spend a few hours - I make my own cards too for special occasions! lovetherain, I'm sure you'll all have such fun creating your cards together. Hendrika, you can use these techniques for greeting cards for any occasion. I love to make cards for other special occasions, too. christinalang, your kids will love it as much as you, I'm sure. Great hub. Will see if I can do this with the kiddos. Thanks! RedElf, thanks for the detailed instructions on how to make your own Christmas cards. Obviously you can use the same techniques to make any kind of greeting cards. I have to admit it feels a little overpowering, but if I simply start it should be fine. I have never though of tracing designs, do not ask me why, but I can see now how this can make the whole process easier. KristineWrites, so nice to meet you. Thanks for stopping by to comment. Super in depth! Great hub, thanks! Thanks, billrobinson, glad you found the instructions easy to follow. Very good instructions. Interests me. Thanks! Thanks so much, hattersmen. So nice of you to stop by and comment. Personalized Christmas cards are always a good gift because they come from the heart. You are most welcome, luoye - thanks for your comments. Thank you very much! ! I learned a lot! ! ! Thank you! ! ! Looking forward to your visit, there may be what you want! ! ! Thanks for your instructions, screation! 1. Take a chart paper, cut the chart paper to required size, and fold it. Mark the front and backside of the card. 2. Draw your design on the front side of your card using pencil. You can draw the design of your own idea or you can draw the design from the pre-captured photos and pictures. 3. 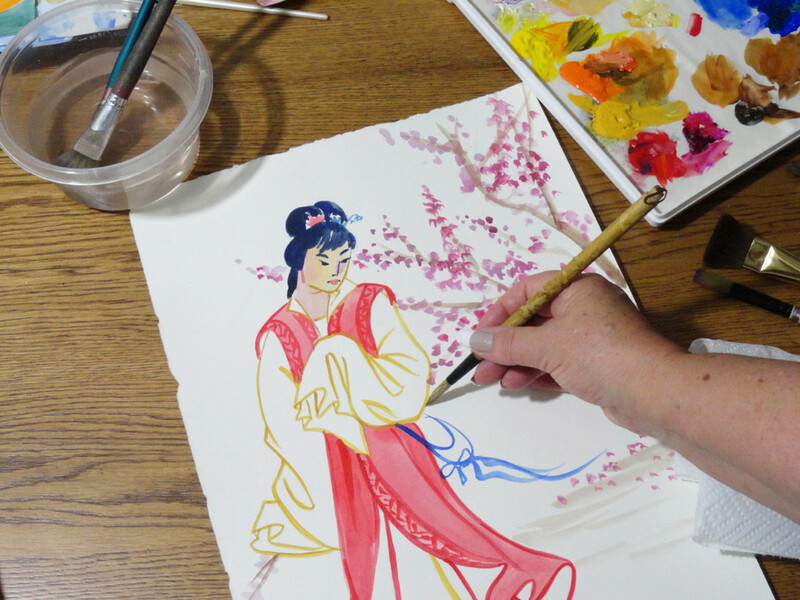 Color your design using the watercolor paints and wax crayons. Use appropriate brush (thin or thick) to paint your design. 4. Inside the card, you can also make other attachments such as a battery with light so that the card will glow whenever the person opens it, or attach some music clips so that the card will sing a song whenever the person opens it. 5. You can also use the decorative items such as color papers, glittering letters etc to decorate your handmade Christmas card. 6. Now your greeting card is ready. Hh, you are most welcome - so nice to see you! I find it so fascinating when artists talking about how to do it. Thank you so much. There is nothing quite as special as a handmade gift these are simply wonderful! Thanks so much, Jeff. Nice of you to stop by and comment. Glad you enjoyed the hub. There are some terrific directions in here. Everyone who wants to make their own holiday cards should read this Hub. Love this idea and your clear instructions. Must put my mind to producing my cards - somehow! Thanks so very much, BK. I appreciate your enthusiasm and the rate-up. :D Have fun, whichever you choose. Oooh how absolutely lovely. I am going to see about doing this or the origami. I'd love to get such a card in the mail. I've done origami so...Hmmmmm. Thanks a million for the inspiration! Yay! Rated up! Thanks so much, Carrie. I love making my own cards, because then I have the joy of creating them along with the joy of giving them. You are most welcome, tnderhrt! I hope you make a hub about your cards - I always enjoy seeing other creative folk at work. Pam, thanks for the visit, and the rate-up. The only way I ever get them done is by making them for a class, but boy, do I hear you. Red Elf, I think this is a beautiful idea. I would like to try that sometime but we life is just about upside down right now and I know I don't have time for one more project. Great idea and rated up. Well written, detailed hub, a lovely idea. I love making my own personalized cards! Thank you!